With an intense fire season already underway before summer officially begins, firefighters need all the help they can get – even from space. Scientists at NASA’s Jet Propulsion Laboratory in La Canada Flintridge are using data from satellites 400 miles above Earth to measure the moisture in Southern California soil and vegetation. Fire agencies used to wait two weeks for these vital satellite images. "This is going to be good. We're excited about it,” LA County Fire Assistant Chief Frank Vidales said. “This satellite information will give us real-time information on fire danger." JPL’s Son Ngheim said the images paint a very dry picture. "We're really looking at elevated fire danger season," Ngheim said. Fire danger is especially high this year because of what scientists are calling double jeopardy. 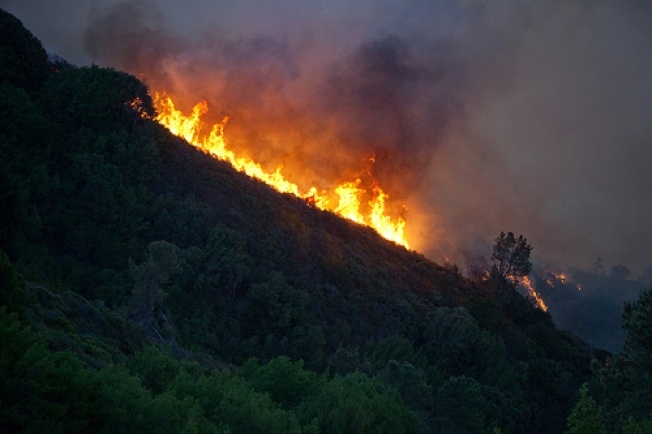 "We received rainfall during peak growing season of chaparral, but it ends up drying rapidly and now it's available for wildfires," Vidales said. A satellite image, pictured at right, of the Inland Empire taken at the end of February show dark green areas indicating heavy brush. But take a look at the same area on May 1 – the day the massive Summit Fire broke out in Banning – and much of that green has turned to brown, indicating dried brush.